Matching Dragoons: Weird Western Tales #46 "The Savage Streets"
Weird Western Tales #46 "The Savage Streets"
March, 1862. St. Louis, Mo. We see Scalphunter climbing up the outside of a building, knife wielded between his teeth. Two days have passed since last issue and he has finally made his way back here searching for Bat Lash. Scalphunter makes his way, via rooftop, to the warehouse of Cyrus Calhoun. He overtakes the guards, killing both of them and then breaks into Calhoun's study, demanding to know the location of Bat Lash. At knifepoint, Calhoun spills the info that Lash was taking the Gatling Gun and was going to auction it off to the highest bidder. Scalphunter demands Lash's location but Calhoun says that he doesn't know, the army doesn't know, everyone is looking for Bat Lash. He says that lash had stayed at the Grand Hotel earlier and Scalphunter tosses him aside, crashing Calhoun's skull against a nearby safe. Scalphunter moves off into the night, making his way through the shadows of the city in search of Bat Lash. We find Mr. Lash a lot easier for he is in the Hotel St Louis, in the company of two 'lovely' French ladies. As they are about to kiss, two men kick in the door, shouting and Lash dispatches them quickly with the help of Mr. Colt. Bat goes through the dead men's pockets, finding Confederate money. He steals one last kiss and departs just as the sheriff arrives. Under cover of dark, he makes his way down to the riverfront, sneaks into a warehouse and checks on his precious Gatling Gun. He wanted to be sure that General Beauregard Smith, a bidder in the upcoming auction, hadn't made off with the prize weapon while bat was combating the General's hired goons. Lash decides to spend the night with his prize to insure its safety. Just down the street at the Hotel Grand, Scalphunter inquires at the front desk of Bat Lash. The clerk insults Scalphunter and tells him to leave, but when Scalphunter grabs him by the collar and pulls him across the counter, the clerk realizes that the Indian is a white man and apologizes. A couple of other men comes up, asking if Scalphunter is a friend of Lash's and attack him. Scalphunter engages in the fight, picking one man up and hurling across the clerks' desk just as the other man gets off a shot that's creases Scalphunter's...well, scalp, knocking him out. The men gather up his limp form and take him to Gen. Beauregard. Dawn, and Scalpunter finds himself tied to a post in the company of the General. 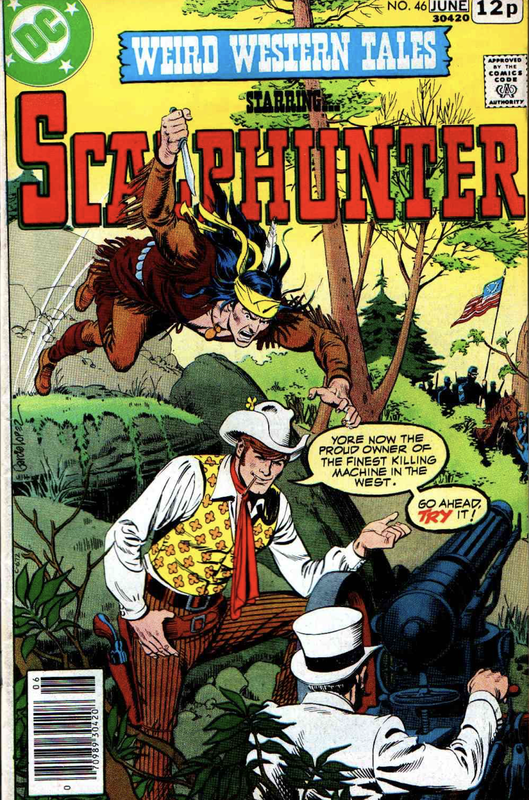 Smith puts forth a plan wherein Scalphunter will help him obtain the Gatling Gun for the Confederacy. Smith explains that since the Confederacy's cash reserves are frozen in northern banks, he plans to steal the weapon. Smith wants Scalphunter to tell him where the gun and Lash are located. Scalphunter says that he doesn't know, Lash is his enemy and if Smith unties him, he will help Smith on one condition...Scalphunter gets to kill Lash afterward. Smith smiles the smile of a man who has instantly struck a bargain. About an hour later (less, actually), Smith and some other men meet with Lash in the warehouse. Bat is perched high atop some crates, shotgun in hand, overseeing the auction. The bidding starts with Mr. Samson, representing the USA, ponying up $5,000 (about $122k today). The second man, Cyrus Calhoun, puts forth $7,000 and Gen. Smith raises it to $10,000. Bat inquires as to if that is Federal or Confederate dollars. Smith states that it would be Confederate, of course, and Lash declares his bid invalid. Just then Scalphunter jumps down from a skylight, smashing Bat Lash to the floor. 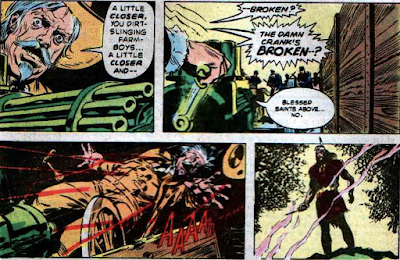 Smith pulls a pistol, mounts up onto the wagon containing the Gatling Gun, and bolts out of the warehouse. Scalphunter is left with the unconscious Lash, Calhoun and Samson. He pulls his knife, weighs his options and then runs into the street, stealing a nearby horse. Scalphunter knocks Lash out and heads to stop Smith. Just then the US patrol shows up and Smith shouts out to them that he is General Smith pf the Confederacy and that they are cowards. The patrol rushes him. Smith starts to crank the handle but it won't move. He is cut down in a hail of Union gunfire as Scalphunter watches. Heading back to St. Louis, Lash explains that he did it for the money but he couldn't let anyone get killed by that gun so he pulled the cotter pins from the crank handle so it wouldn't turn. Lash asks Scalphunter what is plans are. Brian states that his sister lives with the whites. He'll find word of her in St. Louis and he will look for her and find her. The two men part ways. Men Killed by Scalphunter - Two warehouse guards. Injuries - Gut punched, bullet across the scalp. Timeline - Two days prior, one night and the next day. So we have spent four days in March, 1862. Not a bad book overall. Some twists and turns. I especially enjoy the interaction between Scalphunter and Bat Lash, the savage of morals against the gentlemen of scoundrels. Conway's writing can be a little heavy handed, but that is to be expected when your main character doesn't spend half the book spouting forth exposition. Of course, a Lopez cover for me to drool over, never hurts. Next Issue: The Search for his sister, Pit Fighters, and a Surprise from the Past! A JL Garcia-Lopez cover could get me to buy anything! I think he was a rather under-rated artist by DC. But this story was also a good story, with the improbable team-up of Scalphunter and Bat Lash. 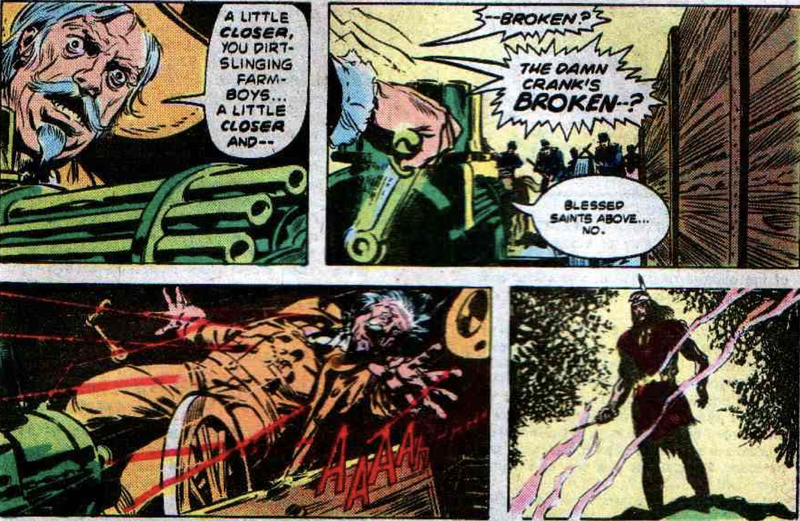 This story, along with the Bat Lash story in the Jonah Hex Spectacular, made me want to see more of Bat Lash. Alas, there was very little more to come at that time, with very sporadic appearances.